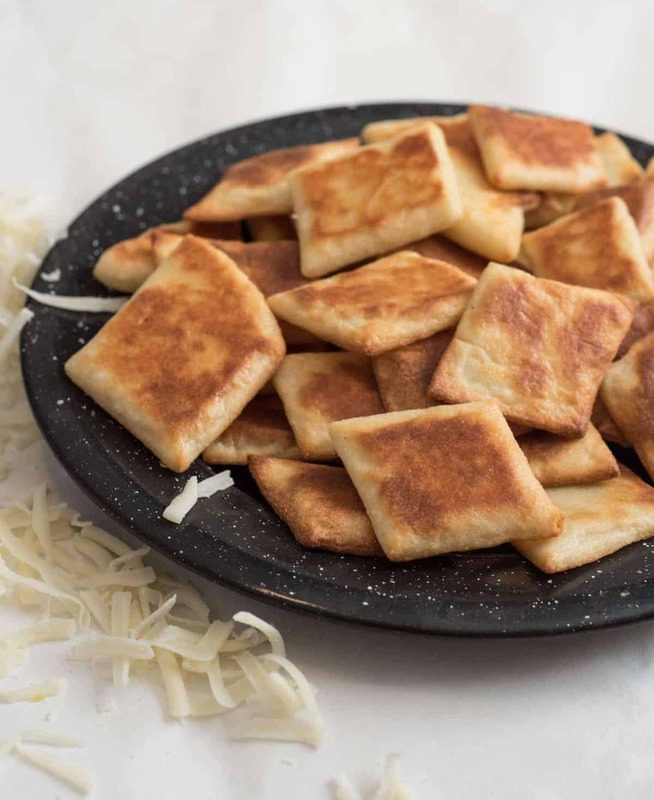 Quick and easy grain-free low carb crackers made with mozzarella cheese and almond flour. You won’t believe how delicious these are! I know lots of folks are doing the Keto, low-carb, healthy-eating thing and if that’s you, this recipe is perfect. If you aren’t doing that, this recipe is still perfect. 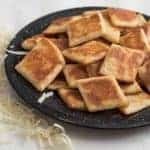 Fathead “crackers” are made with cream cheese, cheese, and almond flour. 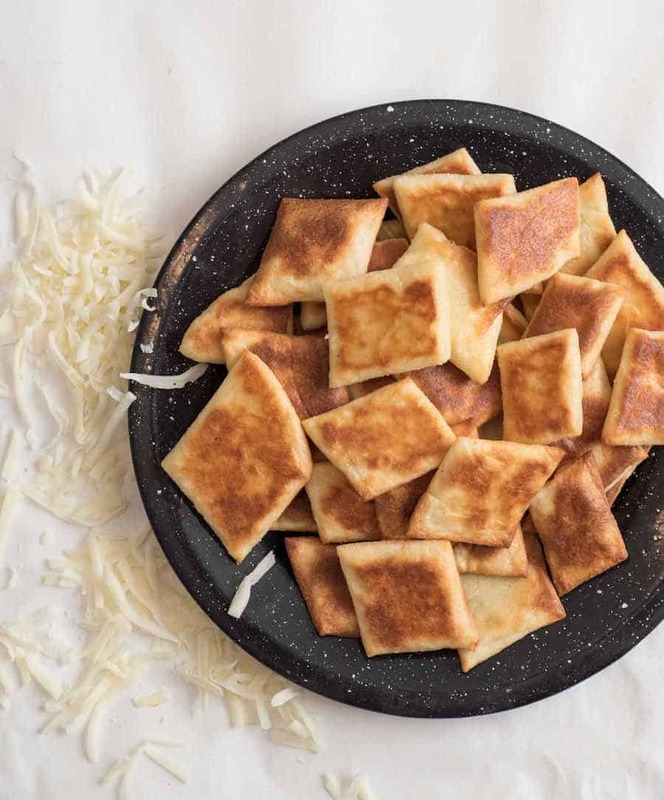 They’re a delicious slightly cheesy cracker with a great texture. You don’t have to be on a specific diet to like these. They’re super easy to make (only take about 20 minutes start to finish), and they don’t have many ingredients in them. Bonus – they’re gluten-free! My kids loved snacking on these while I was working on the recipe. They make a great snack or a simple side for something like our favorite Instant Pot Broccoli and Cheese Soup. The perfect combination of salty, crispy. and chewy makes them absolutely addictive. Use store-bought shredded mozzarella cheese instead of grating your own block at home. Something about the anti-caking agent makes it work better. You can add seasoning to your crackers like a dash of garlic powder or a sprinkle of “Everything Bagel” seasoning. Other cheeses like cheddar don’t work well in this recipe; they just don’t melt and bake up the same. 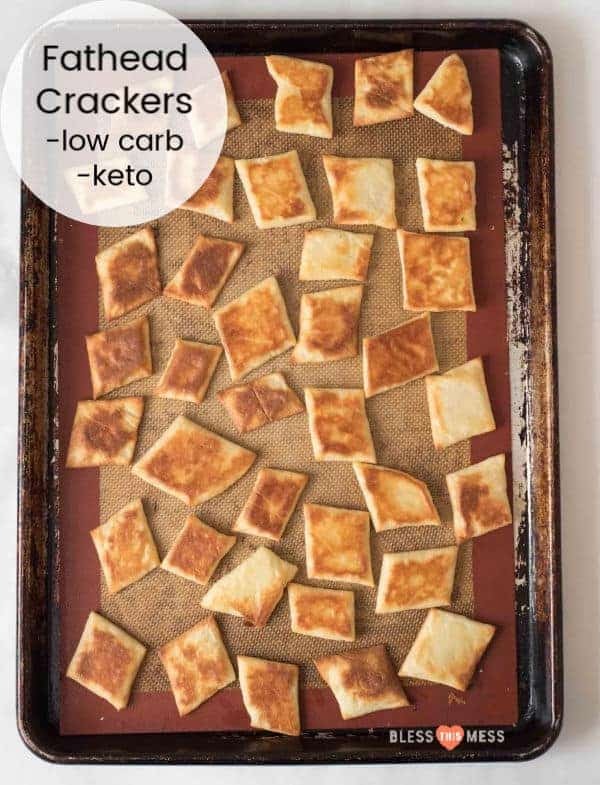 What do you eat on a low carb cracker? If you are doing keto, bring on the fat! These are great with cheese and salami, herbed cream cheese, or even a smear of peanut butter. I love these dipped in hummus, served on a “snack plate”, or eaten with a meal as a bready side. Quick and easy grain free crackers made with mozzarella cheese and almond flour. You won’t believe how delicious these are! In a microwave-safe bowl (a 4-cup Pyrex measuring cup works well), add the mozzarella cheese and microwave on high for one minute. Remove the bowl from the microwave, stir, and microwave again for 3 seconds. Remove from the microwave and add the cream cheese, egg, and almond flour. Stir it together quickly while the cheese is still hot. Roll the dough out to 1/4 inch thickness between two pieces of parchment paper. Remove the top layer of parchment paper and use a sharp knife or pizza roller to cut the dough into squares. 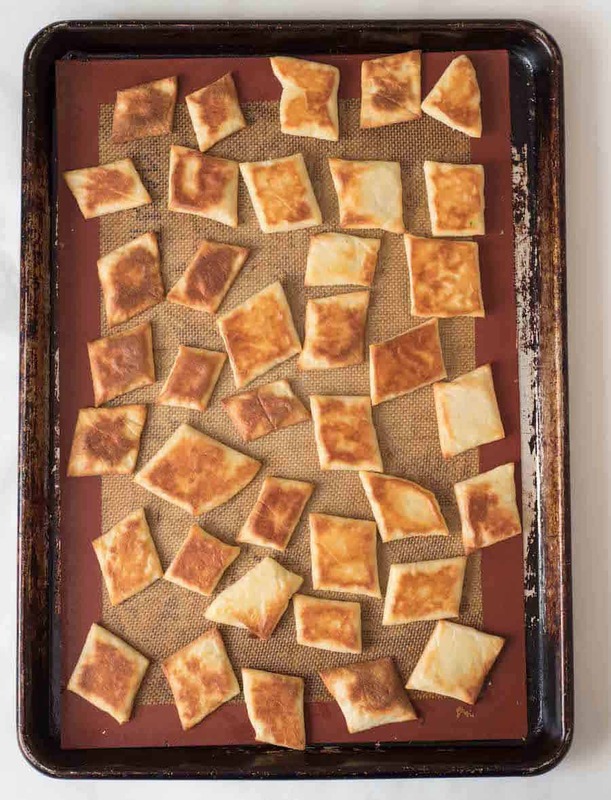 Place the squares on a baking sheet lined with parchment or a baking mat. Bake in hot oven for 5 minutes. Remove from oven, flip over all of the crackers, and bake for 5 more minutes until the crackers are golden brown on each side. Let them cool completely on the pan. Store in an air-tight container. Store-bought shredded cheese seems to work better than grating a block on your own. These sweet babies made their way to the farm the Saturday after Christmas (while we were in Kentucky visiting my parents). Lola had a long romantic weekend with a buck down the road at our friends’ house (after my nephews left her pen open Thanksgiving weekend). We were so excited she was safe after not knowing where she was for a few days that I didn’t even care that she was probably pregnant. 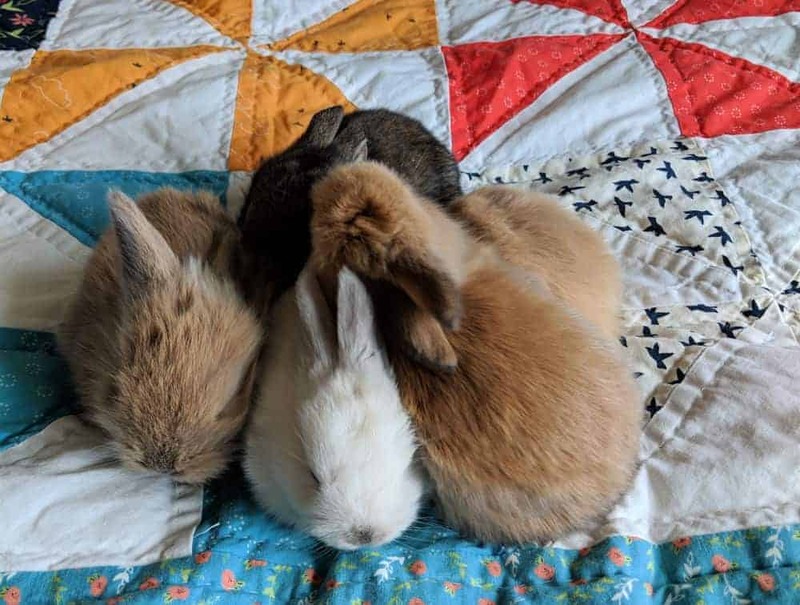 The more I thought about it, the more I got excited for the potential of having bunnies! Just before Christmas, she starting building a nest, and we went into full bunny-prep mode. Mama did great and our neighbor was available while we were gone to check on everyone. Now they are over three weeks old and doing so well. There you have it, one delicious recipe and a little life to go with it.